The markets are about to enter liquidation mode. 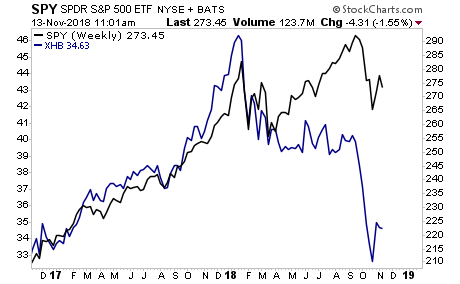 The Fed has made it clear that the only market event that would force it to stop hiking rates would be a collapse so massive that it impacts consumer spending. This means a 2008-type event. By the look of things, we’re on our way towards that. The single largest financial transaction for most Americans is the purchase of a home. With that in mind, consider what the homebuilder industry is telling us about consumer appetite. If you're looking for a sign of what's to come for the overall market. This is it. The stage is not set for a bloodbath as stocks meltdown to 2,100. 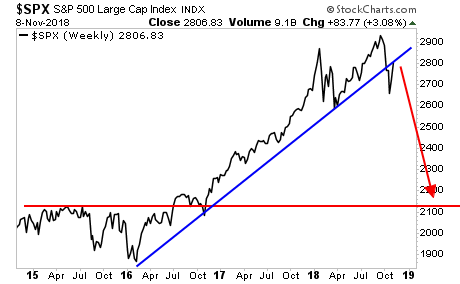 If you want a template for where we are right now, it's "late 2007"... which means 2019 will be when the next crisis hits.